Everyday we receive more and more questions about internet security and data transfer in it. Even some browsers became more aware of links that work with good old HTTP protocol and that’s why everyone installs SSL on their domains. The question is, how to use campaign links with https at AdsBridge? If you are using AdsBridge system domain, that’s added to your account by default, then it’s enough to manually change ‘http://’ to ‘https://’ in the address bar of your browser. If you’ve bought a domain via AdsBridge system, then contact your account manager and follow the instructions. Decide if you want to use HTTPS with one subdomain or with all of them ( if you need only one subdomain then simple certificate will be enough, if you use multiple subdomains then we recommend to purchase a wildcard). Choose a service that sells SSL certificates (there is a big variety of them at the moment). Purchase a certificate (for further notice it can cost over $10, while wildcard can cost up to $100). 4.1 If you are an experienced user, you can use your computers’ console (Linux or MacOS, will be harder with Windows without additional software) and generate CSR and Private key. 4.2 If this is the first time you encounter this, then just use the online CSR generator. When you have CSR, you can activate the certificate. If the domain is purchased in the AdsBridge system, contact your account manager. After activation, you will receive/download the certificate files and, possibly, the bundle from the control panel (where you purchased the certificate). 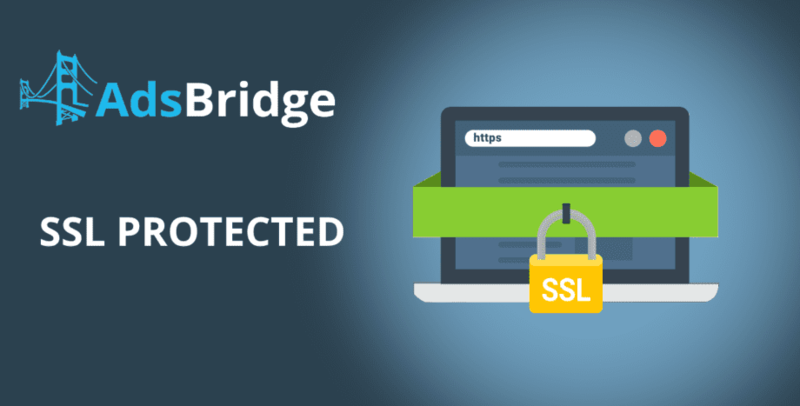 Send the following files: certificate, private key, bundle to your account manager or to e-mail support@adsbridge.com with the subdomain for which we should install the certificate and the ID of your AdsBridge account. After getting the confirmation that your certificate has been successfully installed, you can safely use links with HTTPS. We are working to make the process as simple as possible for you and very soon you’ll be able to install the certificate “in one click“.